This Terracotta Tiled floor was in an old Coach House in Shepperton that had been subject to building renovations for over 2 years. Prior to this, it was used as a motor garage and as a school before that so as you can see from the photograph below it had seem extensive wear and tear and was now in need of full restoration. 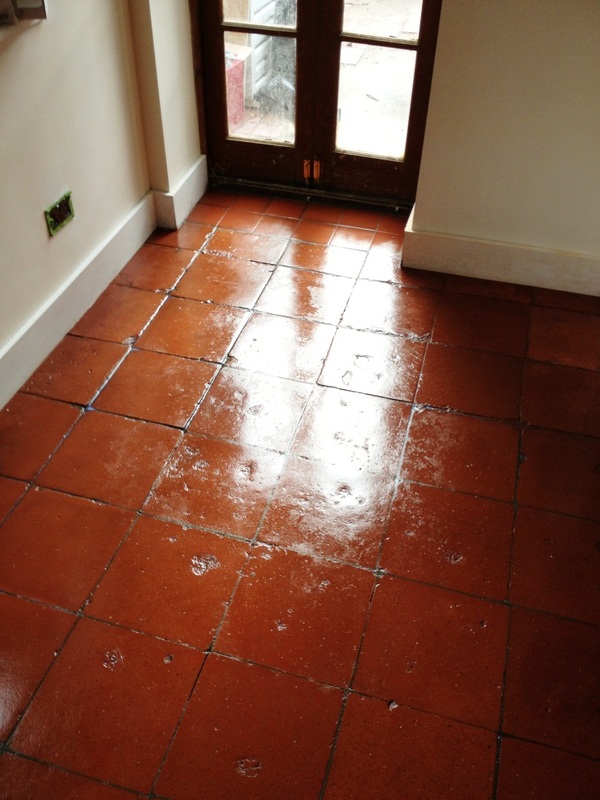 To remove the large build-up of soiI and dirt the tiles were cleaned using a using a strong solution of Tile Doctor Pro-Clean which was left to soak into the tile before being scrubbed in with a black pad fitted to a rotary machine. The process was repeated a number of times and a stiff hand brush used along the grout lines to get the grout clean. Following this we spot treated the areas with paint and oil marks with Tile Doctor Remove and Go which is a strong coatings remover assisted with a steam cleaner to help release the oil from the pores of the tile and bring it to the surface. 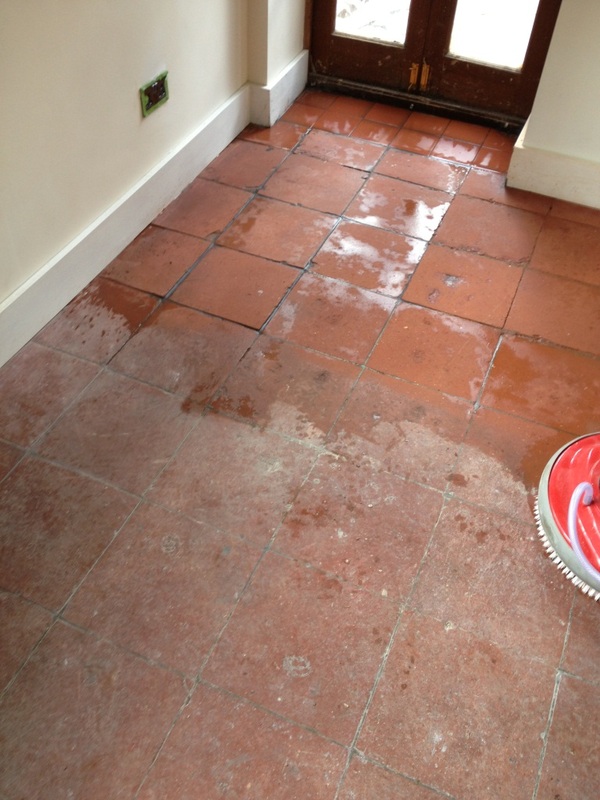 Once happy with the general condition of the Terracotta tile it was given a thorough rinse with fresh water to remove any remaining cleaning product and neutralise the floor before the sealing. We use a wet and dry vacuum to quickly remove liquids from the floor it also speeds up the drying process. We allowed the floor 72 hours to dry due to the porosity of the Terracotta and then returned to re-seal it using nine coats of Tile Doctor Seal and Go. Seal and Go is a water based sealer that doesn’t give off an odour when it’s drying and also offers durable stain protection together with a low sheen finish which really enhances the natural colour of the tile. The work took two days and I think you will agree the floor has had a huge improvement in appearance. If you have a similar floor do get in touch, I cover Shepperton and the surrounding areas outside of that Tile Doctor can put you in touch with your local representative.